To test out the Cricut's ability to cut posterboard, I cut out this tag and flower. I don't have much experience with posterboard; there may be heavier types. This was from Walmart and not much heavier than cardstock. It is however, large. So I can cut it to a size that will fit the 12x24 mat I have on order and use it for larger items like boxes. The test was very successful and if I had stopped there, I would have saved a lot of time. At first I just stuck the tag and flower in the drawer to use later but it was calling me to create something. So I went through my scrap designer paper and found these pieces that went together. The posterboard was a bright white and didn't go with the background papers. 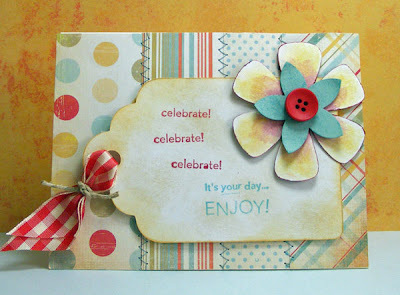 To age it, I used Ranger's Antique Linen and some So Saffron from Stampin' Up! The flower is actually colored on both sides. I got it much too bright the first go round, so I flipped it over and tried some watercolor crayons for a better effect. What started as a quick test, turned into a time consuming card but I'm really happy with it. Saving time is not what making handmade items is about anyway. I bet we all have people in our lives who don't get why we spend so much energy on making something we could just as easily buy, but aren't you glad there are so many of us who do 'get it'? Ingredients: Stamps: On Your Birthday from Stampin' Up! Ink: Antique Linen by Ranger; So Saffron, Baja Breeze, Ruby Red and Rich Regals Watercolor crayons by SU!